If you have a problem in using your SPROG then please check the list of Frequently Asked Questions to see if you can resolve the problem. If you are still experiencing difficulties then please e-mail us using the Contact link on the left. Note the computer (Windows, Mac, Linux and versions; loco and decoder types). If you are using DecoderPro then it is usually helpful to include a log of what you are trying to do. Open a DecoderPro command monitor (from the SPROG menu), log to a file and then try repeating the operation you were attempting; send the log file to us. If you are a new user then please ensure you have read the appropriate User Guide on the Download page. please review all the responses on this page, but if you cannot find the answer that you need, you can always contact us directly. Which SPROG model should I buy - SPROG II or SPROG 3? Or Pi-SPROG? How do I install on Windows 10? My SPROG does not respond to the computer. What do I do? This includes "it used to work"! What does "Error: timeout talking to Command Station" mean? What does "Stopping due to Error: no locomotive detected" mean? What does "Found Manufacturer 123" or a similar message mean? Click on the link to go to the relevant answers and information in the pages below. Where can I buy SPROG DCC? What are the differences between a SPROG and other DCC interface devices? What software do I need to use a SPROG? PC, Mac or Linux? Can SPROG be used as a computer controlled command station/booster? Can I use a booster with SPROG II? What cable do I need to connect to SPROG II or SPROG3? What sort of power supply do I need for SPROG II? Can I use my old DC throttle/transformer/controller as a power supply for SPROG II? How do I know what firmware version my SPROG has? Where can I buy SPROG DCC devices? SPROG DCC is available direct from SPROG USA, and from the UK SPROG shop. SPROG DCC products are also available from selected retailers in the UK, Europe, USA, Canada and Australia. Which SPROG should I use? SPROG II,SPROG 3 and Pi-SPROG One all offer full NMRA standard DCC programming for any manufacturer's standard-compliant DCC decoders. Both are supplied with full software, comprehensive installation instructions and a lifetime warranty and support. The difference is the power available. SPROG II is ideal for smaller scales, and comes with a 12V 1A capability; SPROG 3 and Pi-SPROG One provide exactly the same programming and operation functions, and also offers 14V or 18.5V, 2.5A capacity for larger scales, or for some of the newer sound decoders that like a little higher voltage for reliable programming. SPROG II - and SPROG 3 - are each a stand-alone DCC decoder programmer and DCC controller. The SPROG products are not an interface to a DCC system, but do the things a typical Command Station does, in an easy to use, computer-controlled manner. For all decoder programming, and for any use in N or smaller scales, SPROG II is recommended. For smaller layouts, within the 1 Amp power capacity of SPROG II and the power supply, 12 Volt, 1.25 Amp as supplied, SPROG II's firmware and JMRI software gives full computer controlled command station functionality as well, either for small layouts or larger layouts when used with an external booster. The SPROG3 offers all the same SPROG II capabilities, with a 2.5A maximum current capacity, and is supplied with a 14 Volt 3.0 Amp power supply. This makes it suitable for larger scales where higher track voltage is desired, and to run a layout standalone, or with additional boosters. Note: Some sound decoders have been found to respond better when programming with a higher voltage supply than the 12V we usually offer with the SPROG II, and so if you have TCS WoW, Broadway Limited or some other newer sound installed we do recommend that you purchase the SPROG 3 package to get the higher voltage, or contact us at sprog@bbmgroup.com for advice, or to obtain an alternative or replacement power supply. There are other DCC devices, such as Locobuffer, that are designed to link the computer to an existing DCC system, and the DCC system then provides the response to computer-sourced commands. 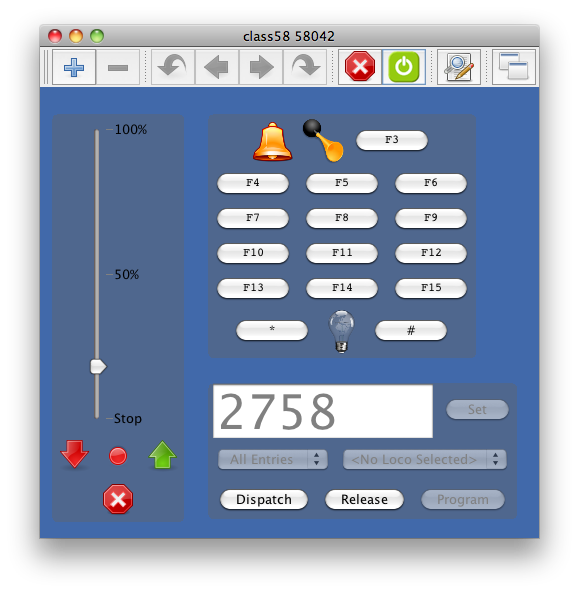 For stand-alone programming, SPROG II and now SPROG3 provide a comprehensive programming solution that can be used in the layout room, or anywhere else, for NMRA-compliant decoders of any scale, including sound. Also, for small layouts needing under 1A total current, SPROG II can be used to control the layout directly, acting as the DCC Command Station, without needing any additional DCC system hardware. SPROG3 increases that current capability to 2.5A, more than enough for many layouts, and the SBOOST booster allows the addition of further power sections, up to 2.5A each. What software do I need to use my SPROG? We recommend and supply JMRI DecoderPro. There are also other railroad control programs available that now provide support for SPROG devices. It is possible, but tedious, to use a SPROG with a terminal emulator (but not recommended!). DecoderPro requires that you have Java installed on your system from Oracle; also included on the installation CD. Look at the online install pages to run an immediate install or re-install of the current production software and drivers. Also, review this video of the driver installation if you find any difficulty in getting the Windows 7 driver to install correctly. Windows 8, 8.1 and 10 add a new level of security, which needs to be adjusted to install; please download the Windows 8, 8.1 and 10 Install instructions for full details. Can a SPROG be used as a computer controlled command station/booster? For smaller layouts, within the 1 Amp power capacity of SPROG II and the power supply, 1.25 Amp as supplied, SPROG II's firmware and JMRI software gives full computer controlled command station functionality, either for small layouts or larger layouts when used with an external booster. The Sprog incorporates a dynamic current monitor that provides full circuit breaker functionality and no additional circuit breaker is beneficial. In the presence of an over-current (which setting you can adjust) the Sprog will shut off the output and then retry about twice a second until the problem is cleared, or you turn track power off. During this the power indicator light will flash fast to announce the condition. The new SPROG3 offers all the same SPROG II capabilities, with a 2.5A maximum current capacity. Additionally, the SBOOST boosters can be used with SPROG II, SPROG3 or Pi-SPROG to add another 2.5A capability each, and/or auto-reverse for loops and crossovers. Can I use a booster with a SPROG? Yes, SPROG II, SPROG 3 and Pi-SPROG can be used with track power boosters, especially our SBOOST device. The SPROG does not need or benefit from programming boosters. They actually do not add anything to the SPROG capabilities, and some do not work at all. For programming, the NMRA specification says that any conforming locomotive will need no more than 250mA to program, and SPROG II is fully able to support this. Some of the sound-equipped locomotives draw higher currents starting up, and so have had issues when programming on conventional DCC programming tracks, but again, we have developed SPROG II and SPROG 3 to support these needs. Some sound decoders have been found to respond better when programming with a higher voltage supply than the 12V we usually offer with the SPROG II, and so if you have TCS WoW, Broadway Limited or some other newer sound installed we do recommend that you purchase the SPROG 3 package to get the higher voltage, or contact us at sprog@bbmgroup.com for advice, or to obtain an alternative or replacement higher voltage power supply. If you do want to run your layout from the SPROG II (or 3 or Pi-SPROG) and your computer, then a booster that increases available track current can be used with a SPROG very effectively. See the details of our SBOOST 2.5A Booster for more information. SPROG II and SPROG3 are supplied with the appropriate USB cable. Should your cable have been lost or damaged, you need a USB A to USB B cable. This is the same cable as used for most USB printers, and can be purchased from any electronics store, or requested from us. A well regulated power supply is required giving 12 - 15V DC for SPROG II, or 12-20V for SPROG3 or Pi-SPROG. No NMRA	conforming decoder should require more than 250mA during programming. Some decoders will draw more than this momentarily during power up and the ACK pulse generated by pulsing the motor could be more than this, depending upon the motor. We recommend a supply of at least 1.25A, as available from this site. We supply as standard a 1.25A supply that supports even those higher power (especially sound) systems that take a higher inrush current. Probably not; in fact, please don't! Many old DC powerpacks/throttles/transformers/controllers do not provide smooth DC and are unsuitable for use as a power supply for SPROG II, SPROG3 or SBOOST. You may find that operation is erratic using such a unit as a power supply for SPROG devices. You should see the firmware version reported in the command monitor, e.g., "SPROG II Ver 2.7". So how do I get the latest firmware? SPROG firmware tends to be changed as new electronics becomes available, prompting new versions of the SPROG device. We do not typically make regular or frequent changes. New SPROG IIv4's shipping from February 2017 are "series 4" and the firmware version is currently v4.1. SPROG IIv3's shipped from 2012-2016 are "series 3" and the firmware version is v3.1. The series 2 firmware is version 2.7 (unchanged since July 2010), or 1.8 if your SPROG II is "series 1" and has 1.x version numbers. The current SPROG 3 firmware is version 4.0 or newer; older series of SPROG 3 exist with 2.x, and 3.x firmware versions as appropriate to the internal devices used in the hardware. Please contact us with any version questions. If your SPROG is doing all that you need without issues, upgrading is not needed, but if you have problems and need support for some of the latest sound decoders, or if you use SPROG as a Command Station to run your layout, the newest versions may have some improvements for you. Contact us at sprog@bbmgroup.com directly to arrange an upgrade. What software do I need to install to use my SPROG? What lights should I see on my SPROG II or SPROG3? What does "Error timeout talking to Command Station" mean? The SPROG II and SPROG 3 devices are supported for Windows (versions from 2000 up to Windows 8, 8.1 and 10), MacOS 10.5 and later, and most Linux packages. All the software that you need is on the supplied CD, and is also available online at our online install pages for immediate installation or update. You do not need to search the web or download any extra items! SPROG needs a device driver to tell the computer how to recognize and connect to the SPROG, and the right drivers are included in the installation software. including DecoderPro for programming and organizing your roster of locomotives, and PanelPro should you choose to run your layout. and is Open Source software with many contributors helping to keep it right up to date. SPROG II and SPROG3 devices have two red indicator lights. The USB light will flicker when there is traffic between the computer and the SPROG. On a SPROG II the light will be off otherwise; on a SPROG IIv3, IIv4 or SPROG3 the light will be normally on. SPROG waits for the computer to tell it what to do. Assuming all the installation process works well, plugging in the SPROG to the USB port will enable access. The Red light on SPROG will be steady, showing you have power to SPROG, but not yet to the track. Which PORT has SPROG connected to it. USB SPROGs use Virtual COMport drivers. These present the SPROG device as a "Port" on the computer. To see which Port the SPROG has been assigned, we use the Windows "Device Manager". On earlier Windows machines, right click on "My Computer" then click Properties -> Hardware -> Device Manager. On Windows 7, from the Start menu select Control Panel, then System, then Device Manager. If you see Hardware and Sound click that, then click Device Manager, located under the Devices and Printers heading. On Windows 8 or 8.1, bring up the Power User Menu with your keyboard by pressing the WIN (Windows) key and the X key together, and select Device Manager. On Windows 10, type Device Manager in the "Ask me anything" search box, or click the Windows button and just type Device. note the COM port number assigned to SPROG. Check to see that the Port has no warning showing, as this will indicate the Driver is not correctly installed. you have the wrong drivers installed, and the SPROG is not recognized. To install the right drivers, right-click on the item, and select the Update Driver entry. Override Windows if it claims the best driver is already installed, and browse for the downloaded or CD drivers. This is fully explained in the online install pages. However, with the newest versions of Windows 10 the automatic driver installation usually succeeds. Open the Device Manager, and watch what happens as you plug in, and unplug your SPROG. and that COM Port number is the one you need to select your SPROG when we get to DecoderPro Preferences. If you are still not connecting, then take a look in the Device Manager just in case the COM port got re-assigned. On some computers, plugging the same SPROG into a different physical socket comes up with a different COM assignment. On a MAC, you will immediately see the SPROG port identity in the DecoderPro Preferences, when you try to select the Serial Port setting. For SPROG II you should see a port named tty.usbserial-xxxxxxxx (the xxxxxx usually reads "feedcode"). If it is not showing, run the application System Preferences and select Network (Go to > Applications > System Preferences > Network). For SPROG IIv3, IIv4 or SPROG3, you will find the device through the DecoderPro Preferences, where it will appear as a "usbmodem" device identifier. Using DecoderPro, ensure this port name is selected in the DecoderPro preferences. More DecoderPro FAQs are below. How do I use DecoderPro with a SPROG? Why does DecoderPro show a red warning message? Does SPROG support the DecoderPro Throttle? What can I do if my decoder is not supported by DecoderPro? To configure DecoderPro to work with your SPROG you must start DecoderPro and set the Preferences. From the File menu (DecoderPro menu on Mac) select Preferences. Select "SPROG DCC" as the System Manufacturer, and "SPROG" as the System connection. Be sure to select "SPROG" mode for programming. "SPROG Command Station" mode is also offered, and can be used to control a layout, and "program on the main", but not for general programming. See the SPROG User Guide (PDF 1.49Mbytes), 54 pages for more details. JMRI DecoderPro will look for a port to connect to. It will find from the system a list of actual and apparent ports, and will show that list in Preferences. You select the one that has SPROG connected to it (the COM Port number in Windows; a tty.usb... entry in Mac). Save the Preferences; you will exit DecoderPro when prompted to save the preferences. otherwise start DecoderPro again and you will see the main menu and roster screen. Once DecoderPro is running and the main menu screen appears, select New Loco, and in the Programmer window that appears, click "Read Type from Decoder". Now the Red power light on SPROG will flash, indicating Track Power, and will try to read the decoder on the track. see below for any Error message shown at the bottom of the window. We strongly recommend you upgrade to the latest production version of JMRI that includes DecoderPro; look at the online install pages to run an immediate install. At the bottom of the DecoderPro screen the status bar shows which DCC connection is currently available. When correctly set up for Programming, the screen will show a green message "Service Mode Programmer SPROG is Online", but right next to that a red message "No Operations Mode Programmer Available", as shown in the image to the right (click on the image to see it full size). This is not a problem! SPROG can be a Programmer (Service Mode), or a Command Station (Operations Mode), but not both at once. The choice is set in the Preferences. To set up your SPROG to allow easy switching from one mode of use to the other, many users will set up DecoderPro for Programmer Mode, and then use the PanelPro icon to start up in Operations Mode. Note: Your SPROG must be shut down, and then re-powered when switching between modes of operation. "Error talking to Command Station (306)" messages mean the computer and the SPROG are not communicating, or message traffic has timed out. If you have been working successfuly, and then this mesage appears, it can be due to timeout between the decoder, the SPROG and the DecoderPro software. Try the action again, and see the notes below about error 301, "no loco detected" as the symptoms can be the same. This could be that the USB cable does not connect, or your USB port is still not set right. This is often caused by a mismatch between the COM port selected in DecoderPro Preferences (edit menu) and the COM port to which the SPROG is actually connected. USB SPROGs use "Virtual COMport" drivers, so the SPROG appears as a Port device on the computer. A first check to make is to close any JMRI programs, turn off the SPROG (disconnect power by pulling out the green plug, and disconnect the USB) and then reconnect. Then check the COM port number. Click + next to "Ports (COM & LPT)" and note the COM port number assigned to SPROG. Ensure this is selected in the DecoderPro preferences. If this is showing the right PORT, but not getting DecoderPro to run, then we can look at the Config file and go from there. On a MAC, run the application System Preferences and select Network (Go to > Applications > System Preferences > Network). For SPROG II you should see a port named tty.usbserial-xxxxxxxx (the xxxxxx often reads "feedcode"). where it will appear as a "tty.usbmodem.xxxxxxx" device identifier. Your current Profile settings are located on Windows in C:\Documents and Settings\your-name-here\JMRI or c:\Users\your-name-here\JMRI (unless you have deliberately moved it). On a MAC it is at your-name-here -> Library -> Preferences ->JMRI. it will be recreated next time you open DecoderPro and you select preferences again. If you are not connecting DecoderPro to the SPROG successfully, close DecoderPro, delete the current Profile, and then start DecoderPro again. You should now be prompted to select Preferences again. If not, the file you deleted is not the one DecoderPro is trying to use; search for any other files with this name and delete all of them! Similarly named files exist for PanelPro, or other JMRI tools, if you have used them. The next most common message is "Stopping due to Error: no locomotive detected (301)" which is most often due to dirty track, or some other reason why the decoder in the loco does not respond to the signals from the track. This message means that SPROG is working, but is not seeing the decoder in the loco for some reason. Loco-to-track, track-to-SPROG, or decoder-to-wheels connections should all be checked. If you see this message, look at the SPROG device itself. The red Power light on the SPROG will be steadily lit while the SPROG is on, but inactive, and the Power light will wink on and off about twice per second when the Track Power is turned on. Try the operation, such as "Read Type From Decoder" that you were using once more, and observe the Power light. If it is flashing, but the loco is not responding, then check wiring, etc. Note: SPROG detects the presence of the decoder by measuring track current (as do other programmers also), and looking for specific current pulses as the decoder reacts to instructions. If you have a decoder which does not have a motor connected (e.g. a "Function only" decoder), those current pulses may not exist, and so SPROG will not see the response. Some other decoders also do not return good motor current pulses, and so do not seem to be detected by the programming sequence. In these cases, it is not unusual for an operation to be executed successfully, such as writing to the decoder a new value for a CV, but the SPROG cannot tell, and so DecoderPro flags the problem. Try seeing if the effect you were programming has been successful, by running the loco and seeing if it responds as desired. Some older decoders need to be addressed in "Paged mode", but all newer decoders use "Direct mode", which is very much faster. 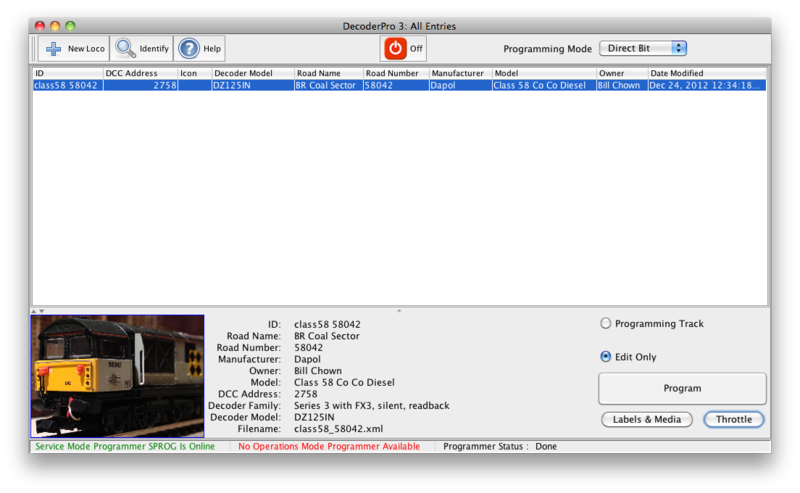 DecoderPro is set by default to Direct mode for most decoders; to manually switch to Paged mode for non-responsive older decoders, select the Programming Mode at the top of the programmer window. If all of these fail to solve the problem, then the decoder could be bad; try it on another DCC system if available, or very unusually the SPROG could be miss-set. Contact us. What does "Found Manufacturer 123" mean? Ah Ha! Your computer did an update! Actually that is the usual cause of a set of problems that are seen in several versions of JMRI, but that are now fixed in v4.14 onwards. The issue happens when starting JMRI DecoderPro (or PanelPro) without a good connection to the SPROG (or any other computer-connected system), and this caused JMRI to see this as an incorrect setup, and then reset some key settings. This could happen if the SPROG was not plugged in by mistake, or it could be caused by an update in the computer OS (Windows especially, but also in MacOS) that made the previously selected serial port no longer valid. To correct this, connect the SPROG, start DecoderPro (or PanelPro) and open Preferences. Check that the Connections now point to the right device (reselect it is a good idea), and then look at Defaults. You need to see controls set to SPROG, not Internal, for the mode that you are using. Yes, both in Programming and Command Station modes. In programming mode SPROG will work with one throttle to enable testing of a locomotive. In SPROG Command Station mode, multiple on-screen and wifi throttles can be used with DecoderPro and SPROG. You turn the track power on and off using the Power Control under the tools menu, or by clicking the colored light in the top of the Throttle or Roster window. Any programming operation will always leave the track power turned off, but the Throttle panel can sometimes indicate incorrectly. Look at the power light on the SPROG to be sure. This light is flashing when the track power is on. This sounds like the Speed Steps have got set to the wrong value. That is most likely the problem. Open the SPROG Console from the SPROG menu, and select 128 Speed Steps, then Click Save. If that doesn't fix it, Speed Steps are also set in the Decoder settings, on the Basic page, and must be set to 28/128 there. Read Full Sheet from the decoder in use, check the Speed Steps shows 28/128, and if changed then Write to the decoder (Write Changes on Sheet). Speed steps can also be set in the Throttle window; Right-Click on the slider, open the Properties window and then select the second choice - Display Speed Steps, and Click OK - and then select SS128. Right Click again to go back to the Properties and "Display speed slider" once more for normal use. Can I use SPROG to program new sounds into my sound decoder? Will SPROG work with Broadway Ltd sound equipped locos? Will SPROG work with BLI Blueline decoders? Will SPROG work with QSI decoders? Will SPROG work with MRC decoders? Will SPROG work with TCS WOW sound decoders? Will SPROG work with MTH locos? What about other sound decoders? No. There is (as yet) no standard way of programming new sounds into sound decoders. There are some vendors offering the ability to add or change sounds, and if you want to replace the sounds supplied, you must use the decoder manufacturers' proprietary sound programming device. SPROG II can set all the sound options in the sound decoders by setting CVs, but not replace the sounds themselves. The short answer is yes, but the full answer can be a little longer. These locos are notorious for the inrush current when they are powered up. SPROG firmware has been updated to cope with this, so long as the power supply is of sufficient capacity. Our standard 1.25A supply has been successfully used on most locomotives. If you see problems, you may see improvement if you include a low value current limit resistor (10 ohms is good) fitted in one of the programming track leads. Also see below for more news in the new firmware versions. SPROG II firmware version 2.2 and later supports Blueline decoders by enabling a special mode. Select the menu item SPROG>Console, and set the BlueLine checkbox. Click Save and close the Console window, and program your Blueline decoder! Clear the checkbox for other decoders, as Blueline mode may be slower on other types. Note: at present Blueline mode is only available in SPROG II with firmware 2.2 to 2.7. It is not effective in SPROG IIv3 or SPROG 3. SPROG II firmware 2.5 and later, and all SPROG IIv3, IIv4 and SPROG 3 fully support CV programming and readback for both v6 and v7 and later QSI decoders, including steam. There is one occasional problem, due to a characteristic of the decoder; CV1 in v6 decoders does not always read. Yes, SPROG supports CV programming and readback for MRC decoders. Some MRC decoders seem to indicate that programming does not work, showing "no loco detected (301)" errors; check this by reading back the values - it usually did work correctly, but the acknowledgement was not clear, and so not recognized by the SPROG. SPROG supports CV programming and readback for all TCS decoders, but the WOW units have introduced some challenges. Some earlier WOW decoders were difficult to program with JMRI and SPROG, and some TCS WOW decoders seem to need a higher track voltage than the default for a SPROG II, using our supplied 12V power pack. SPROG 3 is supplied with a 14V power pack, and we also have 15V and 18V units available where necessary. Please contact us for advice, or to obtain a replacement power supply. Few problems reported! We have tested many makes and have been successful in programming all necessary CV values with SPROG II or 3. If you are having trouble using your SPROG with a sound decoder, contact us with the decoder details, SPROG firmware version (SPROG>Console menu item, and read the large window for "SPROG II USB Ver x.x" text), and DecoderPro version (on the opening screen or Help>About menu - current version is 3.10 or later), and we will help you to solve the problems. Which decoders has SPROG been tested with? We regularly test SPROG II and 3 with decoders from as many different families as possible, to ensure support for the maximum range of types and vendors. We will adjust the programming if we find new capabilities or differences that need to be supported. Please consult the compatibility list for a partial selection, and contact us if you have further questions. More decoders are being added all the time. If you are familiar with XML (or wish to learn) then you could write your own definition file. More details on this procedure can be found on the JMRI webpages. Another tack is to ask on JMRIUSERS if anyone has already written the appropriate definition file, or Contact us; we create definitions too! The installation process was simplified in JMRI 2.3.6, where "Import Decoder File" and "Import Decoder URL" menu items were added to the Debug menu. The definition is stored in your preferences directory, instead of the JMRI distribution directory, so that installing a new version of JMRI doesn't delete it. Note, however, that if a newer version of JMRI comes along with a copy of this decoder definition installed, the program will give priority to the specific version that you imported. Download the file to your JMRI installation; default Windows installation will be at C:\Program Files\JMRI\xml\decoders. On a MAC OS X system the JMRI installation is under Applications. Download by right-click (Control-Click on Mac) on the file and selecting "Save As"; you do NOT want to read it in Explorer! It is an xml file, and so will not read easily if you double-click it. To read it (which I recommend in general to see the author's comments), open WordPad or a similar plain text editor, and then find and open this file. Having found the right file, and read the comments, it has to go into the right place (C:\Program Files\JMRI\xml\decoders is the JMRI distribution directory, unless you moved it) and then open DecoderPro, pick from the menu on the first screen Debug>Recreate Decoder Index then quit DecoderPro, restart and check the decoder list for the new type to be present. ZTC decoders should now program correctly. Other makes of decoder will probably still respond but if you have problems, you can turn off ZTC compatibility mode using "Z 0". Unfortunately, it has been found that, even with this fix, ZTC202 decoders do not work with SPROG II. Also look at our How it Works pages for more information. Please feel free to contact us by email any time with your questions about SPROG, DCC, or anything related. All site content Copyright © BBM Group LLC, 2003-2019.